Can't find your country/region? Please click here. Ocean thermal energy conversion is a technology that converts thermal energy into electricity. Tropical and sub-tropical regions where the water temperature at the ocean surface is relatively high are best suited for its use. A special feature of this technology is its capability to generate a stable supply of electricity around the clock. It is thus well suited for meeting baseload demand. In addition, the deep seawater used for power generation can be put to use in secondary applications that can contribute to local industry and promote the local economy in remote island communities. An OTEC system is comprised of components such as an evaporator, condenser, turbine, generator, and pump. This system utilizes the temperature difference between warm surface seawater and deep seawater (taken from depths of 600 to 1000 meters) to generate electricity. 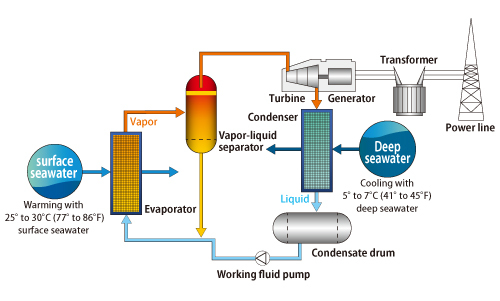 This is done using a working fluid with the low boiling point that vaporizes as the result of heat transfer from the warm surface seawater in the evaporator.The vapor drives the turbine, which in turn drives a generator to produce electricity. The vapor then is passed through the condenser, where the transfer of heat energy to the cold seawater returns the vapor to a liquid state. To maximize the efficiency of every part of this process, from water intake to heat exchange, power generation, and water discharge, this system relies on an integrated control and monitoring system, performance management software, safety instrumentation, wireless communications, and a variety of sensors. Optimizing the overall system will stabilize operation and increase the efficiency of power generation. Okinawa Prefecture is promoting clean energy with the aim of becoming a low-carbon society in the 21st century. Ocean thermal energy conversion (OTEC) technology is particularly well suited for this purpose, and is expected to both reduce the environmental impact that power generation has in the prefecture and lessen the prefecture's dependence on imported fossil fuels. Facing serious environmental problems for the whole earth, clean energy using solar, wind, geothermal, tidal, etc... to reduce CO2 emissions is an inevitable matter. 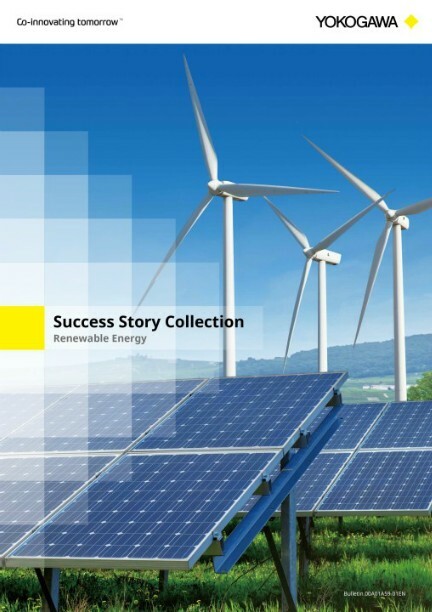 Renewable energy providers need economical/reliable/efficient solutions. 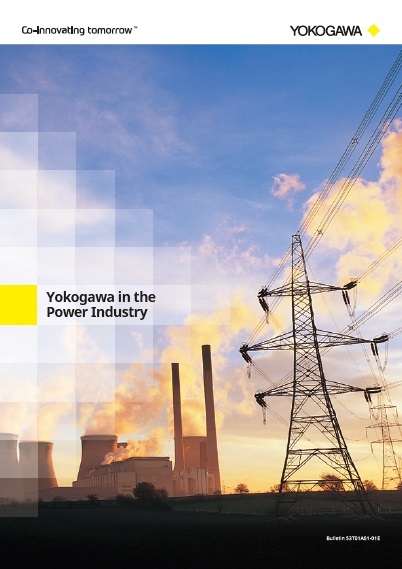 Yokogawa provides a reliable data acquisition system with high accuracy for measurement and control instruments. © Copyright 1994-2019 Yokogawa Canada, Inc.